Appliance Repair Calgary - we are the best! ​We provide appliance repair in Calgary and surrounding area for all major types of home appliances. ​This includes refrigerator repair, stove and oven repair, dishwasher repair, washer repair, washer and dryer repair, washing machines, gas, and electric stoves, ranges, and dryers, dishwashers, freezers, ovens, range hoods, cook tops and a whole lot more! We also install all makes and models of home appliances. Domestic appliance repair is our specialty! Call today! No time to book your appliance repair by phone? We have an online booking system which will allow you to book our expert Calgary major appliances repair services 24/7 without needing to call us. Our system is top-of-the-line and is made to save you time! Our top-notch repair and service will have you back up and running in no time! For the do-it-yourselfer, check out our direct-order parts line 1-866-243-4662. Our repair engineers are trained and qualified to repair your appliances as quickly and efficiently as possible. We are rated as the number one appliance repair company by Homestars for the past four years for our Calgary appliance repair service. This is due to our high level of service and commitment to providing great day service to the residents of Calgary and the surrounding areas such as Airdrie, Cochrane, Bearspaw, Springbank, and others. Give us a service call today. ​Check out our Calgary Appliance Repair reviews! Appliance Services in Calgary - we do it best! We repair appliances like no other business in Calgary. Since first opening in 1997, we have strived to provide our customers with the most trustworthy service possible. ​Our technicians are highly trained and qualified which ensures you get your appliance fixed right the first time! No more waiting around with our technician tracking software. You can see exactly when the technician will be arriving to your home. ​Valley View Appliances is the only company you should go to for dishwasher repair Calgary! Our certified technicians will do everything they can to make the whole process as painless as possible. ​As an industry leader, Valley View Appliances offer top of the line service to get your Dishwasher repaired and in working order as quickly as possible! 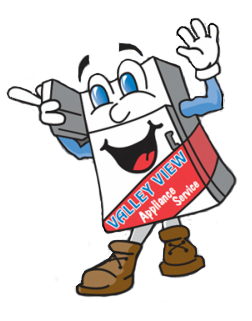 Valley View Appliances is your go-to for fridge repair Calgary! Our certified technicians strive to make your experience successful and stress-free from start to finish. ​As an industry leader, Valley View Appliances is proud to offer top-notch service to get your Fridge Repaired and working as fast as possible! ​Write us a review to let others know! Better Business Bureau certified since 1997 for appliance repair in Calgary and surrounding areas! Homestars "best of" for the past 4 years running for appliance repair in Calgary and surrounding areas!